Our Liberty Sidecars are essentially hand made, limited production items, and for that reason we've found it best to market through direct sales. No distributors or dealers are involved. This enables us to eliminate any further mark up and to present our customers with a reasonable price. Direct sales also has the advantage of allowing good communication between ourselves and you, the buyer. The mechanics of the sale are simple: you list the features you desire from our options and accessories list and submit the list plus a deposit (usually $3,000.00 USD). We issue a serial number for your sidecar and return a receipt and a copy of our build sheet. 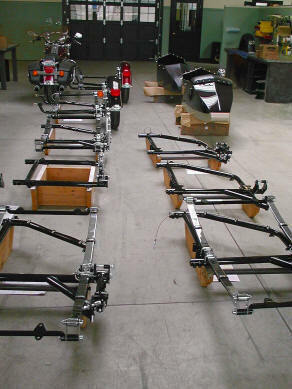 When your sidecar is complete, you are notified, and asked to pay the balance prior to shipping. Domestic shipping is done by truck freight. We enjoy a large discount on motor freight and pass this on to you. Shipments are normally 'freight collect' i.e. you pay the carrier direct.